Cooler Master announced three V Semi Modular-series semi-modular power supplies with 80Plus Gold certification. It includes a 550W, 650W and 750W model. 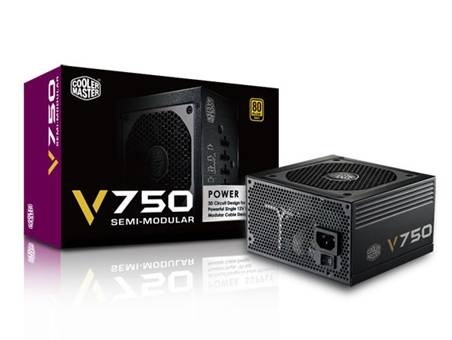 Cooler Master is proud to announce our latest V Semi-Modular (VSM) Series Power Supplies. This new series boasts 100% Japanese capacitors, semi-modular cables for easy maintenance, and high 80 PLUS Gold efficiency -- all while being backed by our Gold Guarantee service plan for outstanding durability and total confidence in your next system build. The VSM series comes in 550W, 650W, and 750W ratings. The Cooler Master Gold Guarantee standard means that, no matter what, we believe in our new line of 80 PLUS Gold power supplies to be the best choice for your next build. While we stand behind all of our products with warranty coverage, technical support, replacements, and parts services, the Gold Guarantee takes it to the next level with full support and replacement on our dime for 5 years -- giving you extreme confidence in quality and performance.